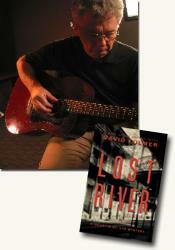 Contributing editor Luan Gaines interviewed Lost River author David Fulmer about creating a mystery, American music's integral role in our history, and the European morality of New Orleans' Storyville. Interviewer Luan Gaines: Personally, I am delighted to have Valentin St. Cyr back in Lost River . Considering the history of Storyville, was it difficult for you to create a new mystery for the New Orleans detective to solve? David Fulmer: It’s never hard to create the mystery. As the late Ed McBain said, it starts with a body. The hard part is solving it. I do not know who committed the crime any more than the reader does. I figured it out as I go. Some people would say it shows. How does the poignant title, Lost River , reflect the tenor of this novel? Two significant locations in the novel are connected by a river. More generally, in dreams and in reality, the Mississippi runs through New Orleans and through the heart of our nation. A river can connect and divide at the same time. These ideas occurred to me after I picked the title. I didn’t think about it that much when I settled on it. It came to me, I liked it, and so I used it. Can you briefly explain Storyville’s unique history? Storyville was a legally-sanctioned red light district from 1897-1918. It had been in business long before being sanctioned by city ordinance. It was located behind the French Quarter, starting at Basin Street and extending four blocks by twenty. Its heyday was from the mid-1990s until around 1915. For that entire time, Tom Anderson, who was called “the King of Storyville,” ran it with a velvet fist. With its grand bordellos, gambling parlors, dance halls, and fine restaurants, it was a destination for sporting men from around the world. But it also had a seamier side and it was this that caused it to be closed in 1918, by order of the U.S. government, with a claim that the sailors at the new Naval Station would be in risk of disease. In truth, it was a moral crusade. Al Rose’s Storyville is the only real history of the place and I recommend it. In 1913, when Lost River takes place, Storyville appears to be in decline. What has happened recently to diminish this unique source of illegal income for the many investors? Storyville had always been under pressure from moralists around the city, state, and nation and those pressures increased in the Teens. These were the same forces that eventually produced Prohibition. That was one factor. Tom Anderson got older and began losing his masterful control of the District. The King of Storyville, Tom Anderson, also seems to be in decline, his hold on daily events slackening, his aging body unable to cope as well as in prior years. Is Tom Anderson truly on his way out? Historically, this is correct. Anderson grew tired of running a place like Storyville, which would be a challenge for any man. He was rich and didn’t need the money or the power. Eventually, he got religion, and turned his back on his own past. Valentin St. Cyr has been gone from Storyville for three years. How many years did St. Cyr work in Storyville before he decided to walk away? Why did he finally leave such a familiar, albeit often dangerous, world? Valentin worked in Storyville from around 1902 to 1910. He left because he was getting older, too, and became bored as Storyville began to decline. His work bored him and he was offered a good bit of money to walk away. Also, Justine wanted a more placid home life, so there was that pressure, too. All of which come into play in Lost River . The enigmatic detective is certainly a man of the era, possessing a skill set unique to Storyville and New Orleans. Were there not such a place as Storyville, what might such a man do for an occupation? That’s an interesting question. He probably would have become a Pinkerton detective in New Orleans or elsewhere. He could do police work, though, given his history, not in New Orleans. There were not very many options for a man like him. How has Valentin’s relationship with Justine evolved? How does returning to Storyville for any reason upset the delicate balance of the relationship? They have a fairly placid domestic life. Justine wanted never to go back to Storyville and wanted him to stay away, too. So when he is manipulated into returning, it causes a serious rift between them. This is one of the subplots of the novel. When the murders begin in Storyville, they occur only on the properties of one man, Honore Jacob. What is Jacob’s history? Is it the King of Storyville’s responsibility to correct the situation before it gets out of hand? Jacob is one of the landlords who own or manage the bordellos and other “sporting houses” in Storyville. These businessmen cared little about the houses. They cheated their tenants and paid graft to bypass health and other laws. No matter where bodies turn up, Tom Anderson is responsible for fixing the situation. His failure to do so right away creates some serious conflicts. St. Cyr used to work exclusively for Tom Anderson, a complicated relationship over the years for the independent St. Cyr Why can’t Anderson personally call the detective back to solve the recent spate of murders? It is a complicated relationship with an errant history. In this case, a man in Anderson’s position of power cannot deign to beg someone like St. Cyr to come back. It would be showing weakness, admitting he can’t handle his own problems. Still, he needs a solution and he’s fortunate that the detective decides to get involved. There is someone behind the scenes manipulating events for a particular purpose, but without St. Cyr in Storyville there is no one with the expertise to unravel the clever plot. Is this new threat more serious than those that have plagued Storyville over time? If so, why? It’s not a worse threat than any of the others. However, it does comes a bad time, when Storyville is in a slump and so it exacerbates an already tense situation, one that has Anderson’s regime teetering. Society preserves its façade of gentility, but the rich avail themselves of vice as readily as the local rounders and gamblers. How does this particular brand of social hypocrisy work? Since New Orleans was and is very much a European city in its attitudes, Storyville did not present the moral issue as it did elsewhere. That’s why this was the only red light district in the country established by law. In fact, what happened was the city made prostitution illegal everywhere else. The hypocrisy of proper and pious gentlemen visiting bordellos was not considered as such. It was the way men of means were entertained and served a distinct social purpose. It’s seems to me a fairly healthy attitude. Buddy Bolden, the great jass musician from a former St. Cyr novel, surfaces briefly in Lost River , his part critical in helping the detective decipher the machinations behind the murders. What is St. Cyr’s sad history with Buddy? Valentin and Buddy were childhood friends. They later drifted apart, but then their paths cross again in Chasing the Devil’s Tail . Bolden had the tragic history of a genius: he created a new kind of music, but lost his mind in doing so. Valentin was there to see his friend’s decline and has never shaken it. Once St. Cyr agrees to help solve the murders in Storyville, his relationship with Justine is severely tested. Why? Does Justine fear more for Valentin or herself? Justine has wanted to leave Storyville behind for a more normal life. She and Valentin have a tacit agreement to stay away from the District. But Valentin breaks that promise and throws their relationship into turmoil. She fears for his life in the physical sense, she fears for her own in terms of what Storyville costs many of the men and women who work there: takes away their souls. The detective has been working as a private investigator for local lawyers who represent wealthy clients, making a decent- and safe- living in the years since Storyville. These attorneys will not consider St. Cyr’s employment should he return to the infamous Storyville. Since his work is confidential and St. Cyr never meets clients, only cleans up after them, what is their concern? What are the future ramifications for St. Cyr if he turns his back on this more legitimate employment? This is where the hypocrisy does raise its head. Even as the wealthiest clients of these firms visit the Storyville bordellos, their public faces are chaste, and they can’t have one of their employees working on behalf of the District. So Valentin is given a choice to turn his back on Storyville and keep his lucrative jobs or help the madams and be out on the street. When the murders begin, the police department keeps a low profile, respecting Tom Anderson’s ability to control Storyville’s excessive vices. But gentlemen of quality are being killed, so the police must become involved, and that means the active involvement of St. Cyr’s nemesis, Captain Picot. What is the nature of the enmity between these two men? There are some things I can’t divulge without giving away deep secrets contained in earlier books. However, one thing is clear and out in the open: Picot resents St. Cyr’s abilities to succeed where he and his people fail. He is jealous of St. Cyr’s skills and furious that Valentin is able to skirt the law because of his connection to a powerful man like Tom Anderson. When the plot behind the novel is revealed, it is clear that only a man such as Valentin St. Cyr could have followed the elaborate twists and turns of a treacherous predator. Might this scheme been successful without St. Cyr there to solve it? Without St. Cyr to make the connections, it might well have succeeded. He is up against a ruthless and clever adversary who will stop at nothing. At the very least, the violence will continue until this person succeeds or fails. You have delivered a number of Valentin St. Cyr novels before Lost River ( Chasing the Devil’s Tail , Jass , Rampart Street ). As an author, do you tire of your characters, even a dynamic one like St. Cyr? Are there any more St. Cyr mysteries in your imagination, or does Lost River truly have an elegiac tone? I suspect that many authors tire of their characters temporarily and I’m one of them. I get tired of their problems and issues, just as I would if I spent too much time with a friend or family member. I have some more ideas for where Valentin might go next. But with the publishing business in such turmoil, it’s a wait and see situation. Music is a vivid and important theme in your novels ( Jass , The Dying Crapshooter’s Blues , The Blue Door ), from jass to rhythm and blues. How do your musical interests both infiltrate and inform your novels? I believe that American music is one of our most prized possessions and greatest exports. The music that came up from the American soil – blues, jazz, country, Latin, rock-and-roll and all their variations and descendants – has played in integral part in our history. So I’ve been happy to have been able to include music and musicians in my books. Along with the drama and mystery, I hope I’m providing little history lessons, too. I’m always thrilled when someone tells me that they didn’t know much about Buddy Bolden or Blind Willie McTell before reading one of my books. Are you drawn to historical periods by the evolution of music, building stories around the birth of musical movements? I’m interested in settings that were “scenes” where music was either born or thrived. I have plans on the drawing boards for books in other places and about other people. Again, music will be woven into the main story or a subplot. Or maybe it will be the soundtrack. I’ll be pleased to able to present these fragments of our musical mosaic and still pull of a good story. What can we expect from your next novel? Any surprises? The surprise will be which novel comes out. Right now, we’re negotiating a new contract and I don’t know which one of three candidates it will be. Whichever book it is, there will be surprises. David Fulmer has been a finalist for the Los Angeles Times Mystery/Thriller Book Prize and the winner of the Shamus Award for Best First PI Novel. He is the author of the acclaimed Storyville mysteries. Contributing editor Luan Gaines interviewed David Fulmer, author of Lost River (see accompanying review), about his book for curledup.com. Luan Gaines/2009.